I never thought I would “create” a recipe, but found myself inspired this past Friday evening. I’d offered to make a cake for my neighbor’s birthday party on Saturday but wasn’t sure if the one I planned on making would be enough for all of the guests. So I decided to make two cakes. I had also meant to make banana pudding for my father in law and, in addition to the other ingredients, had a whole cluster of ripe bananas on the kitchen counter. The bananas are what caught my eye. They really begged to be used for something and I was suddenly reminded of a banana cake recipe I’d bookmarked awhile back. It only took a bit of monkey business before cake and pudding collided with great success! For the cake I used The Cake Bible’s Banana Cake recipe* . I baked the layers in Williams and Sonoma’s fun “Cookie” cake pans which gave them lovely sculpted edges. I also crushed some vanilla wafers and spread them on top of the batter in the cake pans, but the wafers didn’t seem to be noticeable in the final product, so you might as well skip that step. 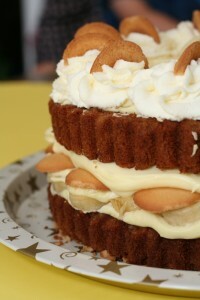 The banana pudding is a southern style pudding made with Eagle brand milk and real whipped cream. It is hands down the best banana pudding I have ever had the pleasure of eating. It is also thick, more like a mousse than a pudding, which makes it perfect for filling a cake. 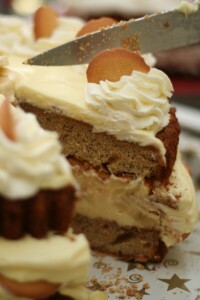 Instead of layering things in a bowl as the pudding recipe calls for I spread a little bit of pudding onto the cake and placed sliced bananas on top of that until the whole layer of cake was covered. Then I spread just enough pudding on top of those to act as glue for a layer of vanilla wafers. Cover the whole cake with cookies ( The wafers look best sticking out a bit from the cake and filling) then top with more pudding. Place the second layer of cake over that and spread remaining pudding on top and smooth out. Pop it into the fridge for a bit to firm things up. You can then garnish however you want: I went with piped rosettes of whipped cream around the outside. Each one was topped with half of a vanilla wafer. A few fresh banana slices were artistically in the center just before I took it next door to the party. It made a really breathtaking cake and I had the pleasure of hearing someone ask if it came from the Cheesecake Factory! In an cold bowl combine two cups of heavy whipping cream, four tablespoons of sugar and two teaspoons of vanilla. Beat on high until thick and fluffy; store in refrigerator until needed. Combine milk & water. Add pudding mix and beat until well blended. Chill 5 minutes. Fold whipped cream into pudding mixture. Spoon 1 cup pudding mixture into bottom of glass dish. Top with 15 – 18 vanilla wafers, and 1 1/2 sliced bananas. Spoon 1/2 of remaining pudding mixture on top, then 15 – 18 vanilla wafers, and 1 1/2 sliced bananas. Top with remaining pudding. Garnish with a few vanilla wafers if desired. You can add more bananas or wafers if you like. 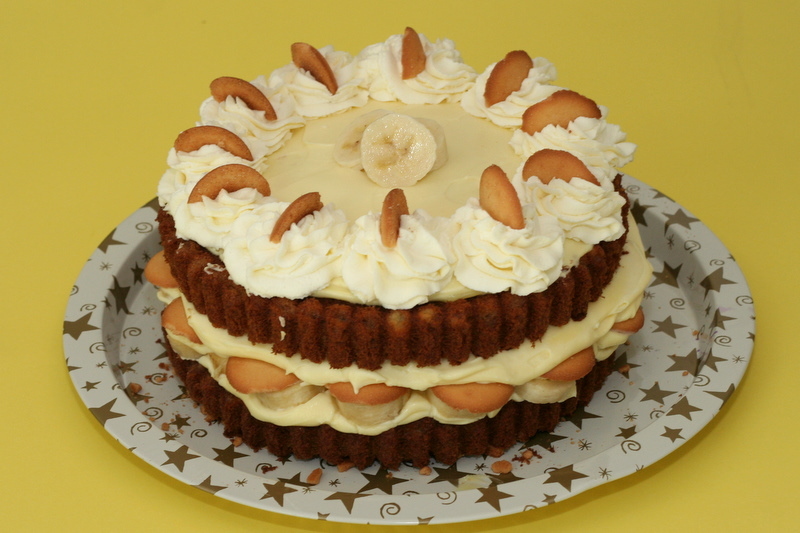 * The Cake Bible website does not allow linkage directly to this recipe, but you can type “banana cake” into their search feature and it will take you directly to it. This entry was posted in Cake, Recipes and tagged cake, recipe. Bookmark the permalink.